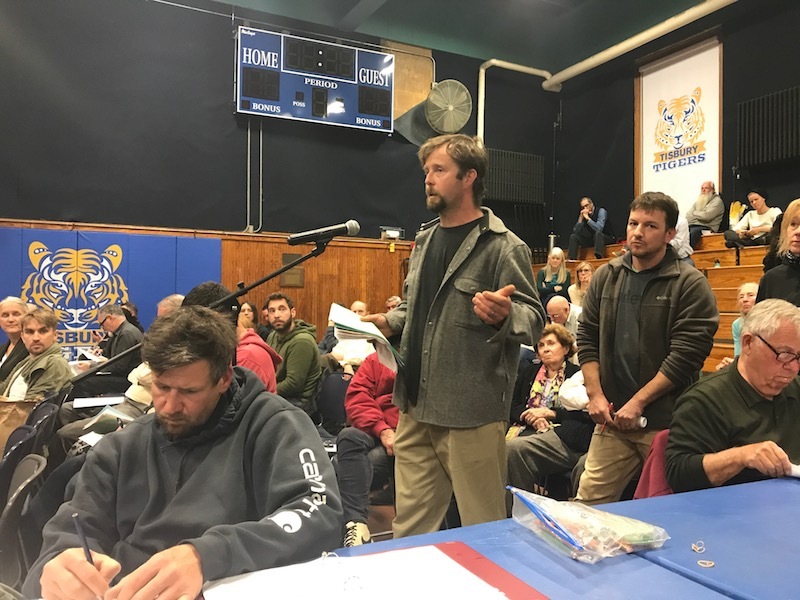 Vineyard Haven boat builder Matt Hobart spoke against housing bank in third night of town meeting. Grinding toward the end of a three-night marathon annual town meeting Thursday, voters in Tisbury rejected the proposed housing bank, showed unity for school funding and bid farewell to a veteran selectman. The 115-75 vote on the housing bank followed three hours of emotional debate over two nights on both sides of the controversial issue. “We need to think of people as a resource and something to preserve as well,” said Holly Mackenzie, one of many Tisbury residents who lined up to voice their support for the housing bank plan. The proposed home rule petition seeks to use revenue from the new short-term rental tax to create year-round housing. “I have a really close friend who through housing glitches ended up living in her car last spring with her toddler. That’s not uncommon here,” said Barbara Lamson. All three selectmen spoke against the housing bank, saying the town already has both the will and a structure in place to address affordable housing. Selectmen Melinda Loberg and James Rogers agreed, calling it premature. “While many people are of the belief that a new short-term rental bill will make money, one can’t guarantee that until after it’s been implemented,” Mr. Rogers said. The town known for letting everyone have a say did not even begin discussing the housing bank until 10 p.m. on Wednesday. After an hour, town meeting recessed until Thursday when debate over the proposal resumed and continued for two more hours. The meeting adjourned about 9:45 p.m. on Thursday after voters approved as $28.9 million operating budget for the town. Planning board member Dan Seidman, an advocate for the bank, emphasized that the details of the proposal are not set in stone. Planning board member Elaine Miller also spoke for the proposal, saying the lack of year-round housing affects Islanders of all ages. 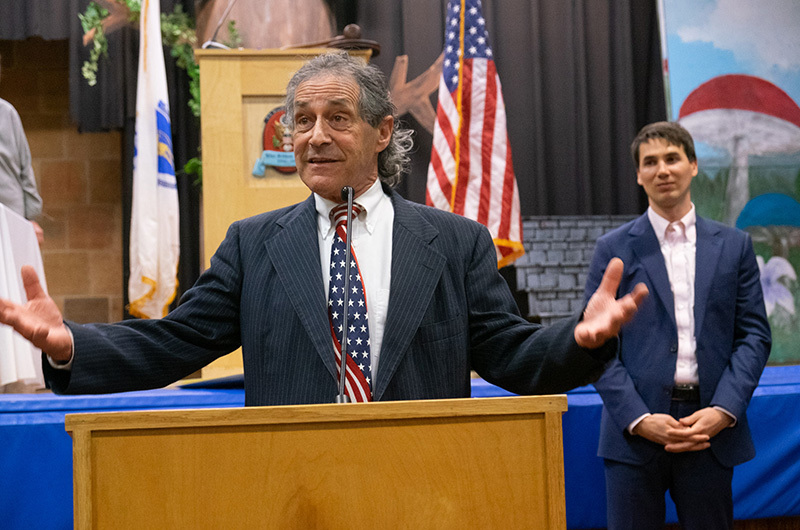 On Tuesday night the meeting began with emotional tributes for Mr. Israel, who is stepping down as selectman after more than two decades of service to the town. State Rep. Dylan Fernandes presented a formal resolution in Mr. Israel’s honor. The resolution detailed Mr. Israel’s political career in the town and acknowledged his musical talent and his landscaping business. “This is someone who’s dedicated much of his life to service,” Mr. Fernandes said. Selectman Melinda Loberg presented Mr. Israel with a gavel and pen on behalf of the town. “I want to say that probably most of the people who are currently serving . . . have been encouraged to be involved by none other than Tristan Israel,” she said. Wearing an American flag necktie and his familiar smile, Mr. Israel received a standing ovation. Voters strongly backed two major school funding requests, one for the town elementary school, the other for the regional high school. In a show of unity, selectmen and the town school committee jointly presented a warrant article to fund $400,000 in design work for a renovation and addition on the Tisbury School. School committee chairman Amy Houghton said town leaders were turning over a new leaf after a $47 million state-backed proposal to build a new school failed at the ballot last spring. “Our goal is to change the dynamic and make sure we don’t have a divided community,” Ms. Houghton said. She presented the article with Mr. Rogers. The money will be used to hire an owner’s project manager and an architect for the project. A new building committee is also planned. “We would like to move forward using the base data that was obtained last year,” said Mr. Rogers. Town resident and high school teacher Anna Cotton said she was encouraged that the process was moving forward, and called on townspeople to get involved early with the new iteration of the project. When one voter asked if a phased project would lessen the financial burden on taxpayers, Mr. Rogers said the town is committed to doing the project all at once. “Staggering the project would be very difficult on the staff and students,” he said. The article passed unanimously, drawing applause. A separate request from the regional high school to fund the town’s share of a $1.4 million feasibility study to overhaul that facility also passed after discussion. The high school plans to use about $316,000 in excess funds from the high school budget to support the feasibility study, and is requesting the remaining $1.1 million from the towns. Oak Bluffs rejected the measure Tuesday night, potentially throwing the proposal into limbo. Tisbury voters agreed to contribute their share of $297,656 Wednesday night. The question will also appear as an exemption to Proposition 2 1/2 on the ballot on April 23. As in West Tisbury, there was some skepticism over a five per cent administrative fee that the county has attached to a series of regional social service programs. In Tisbury on Wednesday night voters took up one article with six sub-requests for services including Dukes County social services, the CORE program for Island seniors, Healthy Aging Martha’s Vineyard, the Substance Use Disorder Prevention Program, the First Stop information service, and Adult and Community Education. The town finance committee recommended the fee be removed from each of the spending requests, and voter Nelson Sigelman moved for an amendment on the town meeting floor. “But for the [finance and advisory committee], we’d never know that not all the money was going to the listed programs,” Mr. Sigelman said. Martha’s Vineyard Community Services executive director Julie Fay agreed that the fee was questionable since it suggests that the county does significant administrative work for the nonprofits in question. “For Community Services, the county does not process payroll, the county does not do audit, the county does not take care of liability insurance. All of that activity is outsourced to Community Services,” Ms. Fay said. In the end after much procedural back and forth, the fee was removed from one of the programs: Dukes County social services. Attempts to eliminate the fee from three of the other programs failed. Voters also agreed to add a full-time assistant fire chief to the town fire department. “We need this full-time position to enhance the safety of our volunteers [and] . . . to ensure seamless 911 coverage for you,” fire chief John Schilling told the meeting, drawing applause. The new position comes with an annual salary of $67,380. Voters defeated a proposal to change the town clerk from an elected to appointed position and backed a $1.15 million spending package for wastewater improvements. • Established a building stabilization fund. The meeting reconvened Thursday night. The annual town election is April 23. Great job done by Deborah Medders! As more than one person observed to me. Are you kidding me? That was one of the worst town meetings ever. Who separates questions from comments and only takes questions first than comments? Poorly run meeting and that is why it went 3 nights.